We ended up today back where we started – at Gargrave. Strictly that’s not true because we started the day outside Gargrave and ended it back inside (up the three locks which start one on the journey to Skipton). Today I was up just after seven and was soon on the tow path walking both dogs. By the time I returned everyone was alive and had enjoyed breakfast. 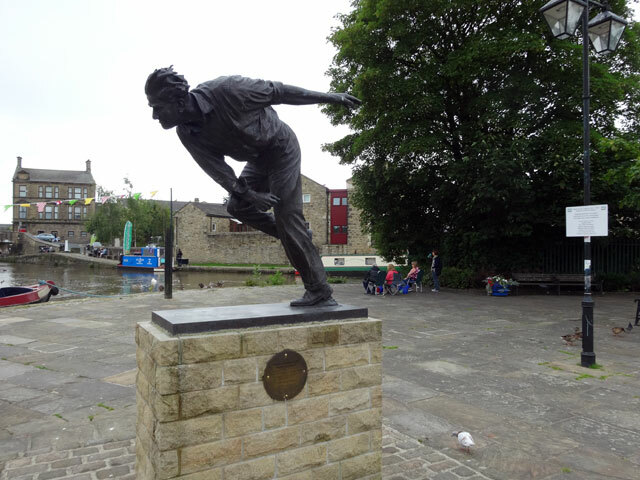 I had a couple of rolls and soon afterwards the boat set off – destination Skipton. I spent most of the journey inside with the dogs – everyone was happier if they were quiet. So I enjoyed a shower and did some writing while Rachel steered, Tom opened swing bridges and Dorothy held lines while the boat stopped to let Tom off and on. 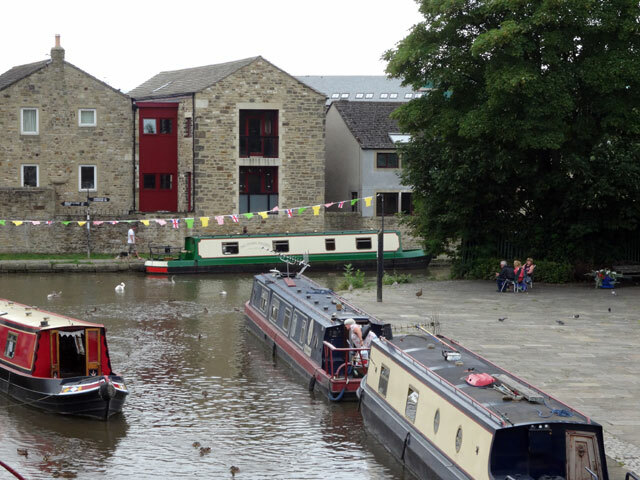 The journey from Gargrave to Skipton has no locks and is a very enjoyable one. 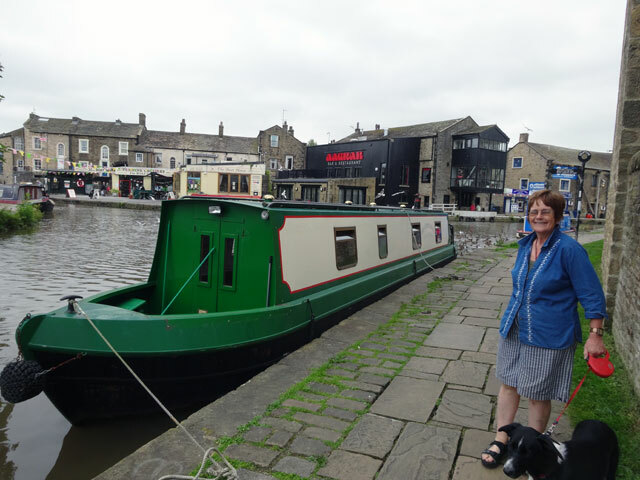 We had wondered where we would turn the boat around but fortune was with us, we arrived in the centre of Skipton where the canal forks off to the Castle, at a time when there was little traffic and so we were able to turn the boat there – even better, just as we completed the manoeuvre, a boat in a prime location on the tow path moved off. So we moved in. Again I stayed with the dogs as Rachel, Tom and Dorothy went off to explore historic Skipton with its market in full swing in the main street. Tom and Dorothy went off to look at the Castle; Rachel returned to the boat and we walked the dogs, on the way assisting a single-handed sailor to get through a swing bridge which carried quite a lot of traffic. I went for fish suppers for everyone at lunch-time. We ate these on the boat while looking at Skipton through the windows. After lunch I went with Tom and Dorothy into the town: Tom bought a hat, a waistcoat and a body-warmer with lots of pockets; I bought a kettle (the one we have is too small when we have guests). 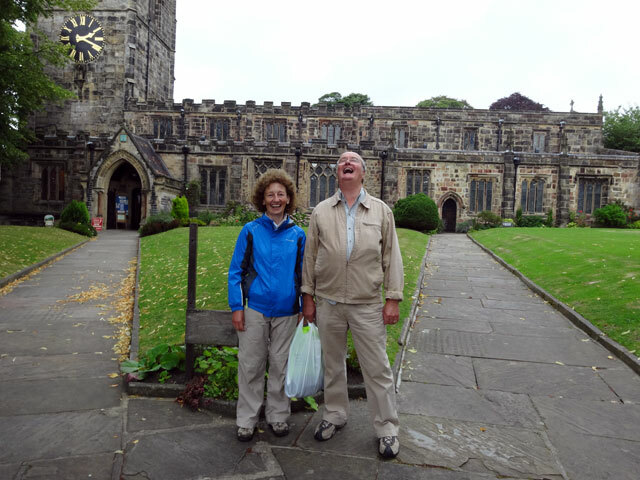 We visited the Church and I asked if anyone knew where the Midland Hotel had been. 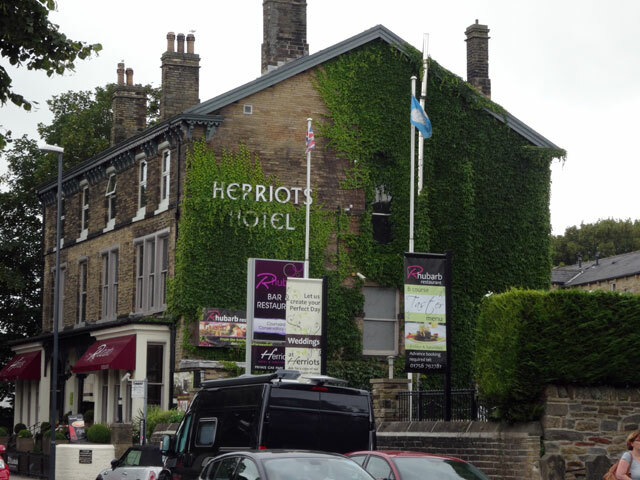 The lady to whom I spoke didn’t, but she directed me to another lady who had been born and brought up in Skipton. She knew exactly. It was the hotel for the railway – that’s why it was called the Midland Hotel – and it backed on to the canal. 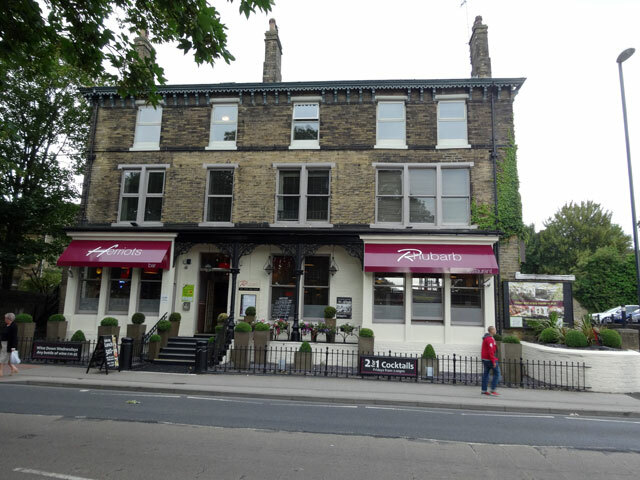 In fact, Rachel and I had walked the dogs past it this morning (It has a quaintly named restaurant: the Rhubarb Restaurant). The significance of all of this is that Mum spent the first night of her honeymoon in the Midland Hotel back in 1945 (Supper, bed, breakfast and lunch cost £2). Tom and Dorothy returned to the boat bringing a beautifully painted tray for Rachel. I returned with a lifejacket with a strong handle for Mix and soon afterwards we set off back for Gargrave – everyone with the same duties as before except that I walked a good part of the way with the dogs in order to tire them out. I was glad that I did as the countryside was magnificent even if it was a bit overcast and a bit colder than yesterday. But the longer the day went on, the brighter it became. Back at Gargrave there were three locks to be navigated, so again there were jobs for us all as we worked our way up to the village. 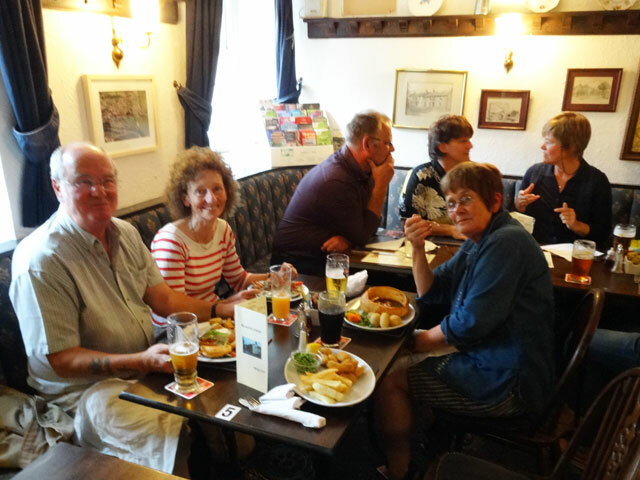 We moored and then went off to the Masons’ Arms (we ate there in 1994 with Jean, Sandy and Anne) and enjoyed a convivial evening talking with those around us – a couple from Bradford (who were into bird-watching) and a boat engineer from Gargrave. I enjoyed French Onion soup followed by scampi and chips. We walked home past St. Andrew’s Church (with a Saltire flying from its flagpole). 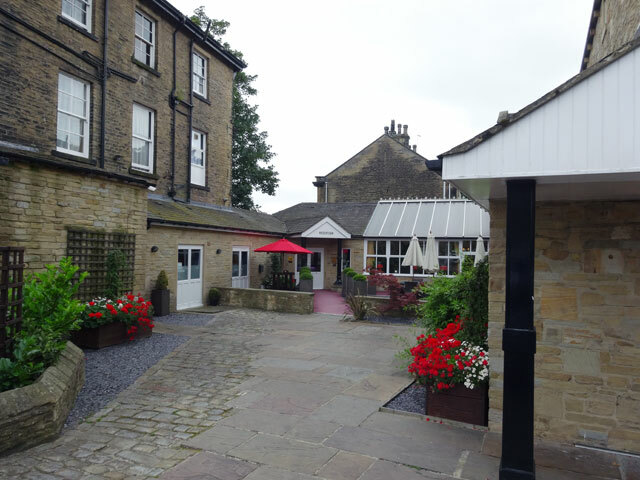 Gargrave is a picturesque little town and it was very good to revisit it. 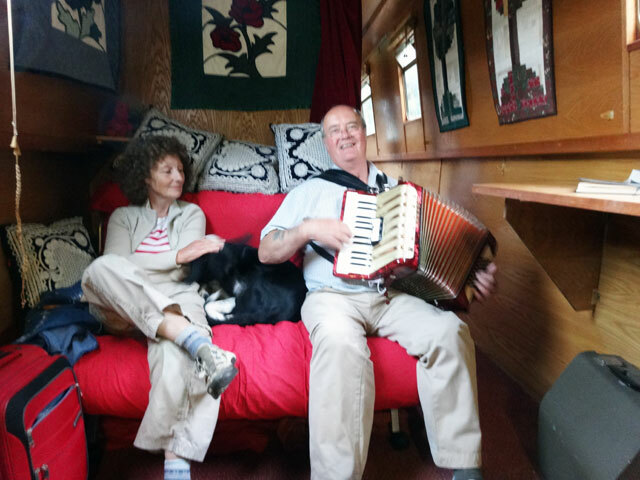 We fed the dogs and walked them and then settled down with tea, strawberries and chocolate while Tom played his accordion and we recharged several of our electrical devices with the generator. A final walk with the dogs and it was time for bed. It has been a thoroughly good day – but my old bones ache!